Pixar's Cars franchise gets a lot of hate. It's largely undeserved, as while it may not be in the same league as their best work, the original film was perfectly decent. The sequel was admittedly a rare misfire for the studio, but next summer's Cars 3 deserves to be approached with an open mind. It would be fair to say that there was little expectation surrounding the upcoming threequel, but the radical tonal shift of the first teaser trailer had many intrigued. Newer details have since emerged, and the latest teaser reveals that rumours of Lightning McQueen's demise may have been greatly exaggerated, however. 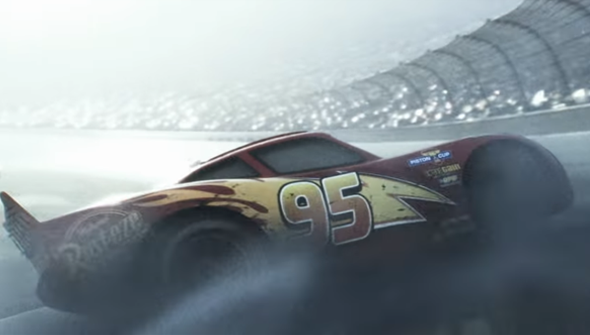 Following the crash depicted in that teaser, one-time champ McQueen has to try and fight his way back to the top, while contending with a newer generation of flashy racers, led by cocky newcomer Jackson Storm (voiced by Armie Hammer). The new trailer starts once again with that crash but goes on to show that the latest instalment isn't such a radical departure for the franchise as it first appeared to be. After the (arguably misguided) sidestep into spy-movie territory in Cars 2, this seems like a return to more comfortable, familiar territory. The trailer features actual racing heavily, and this looks set to be a big part of the movie, which is essentially set to be a classic comeback story. Cars 3 is directed by Brain Fee (a Pixar veteran making his directorial debut) and will be released in the US on June 16th 2017, with the UK release following on July 14th. Check out the trailer below.